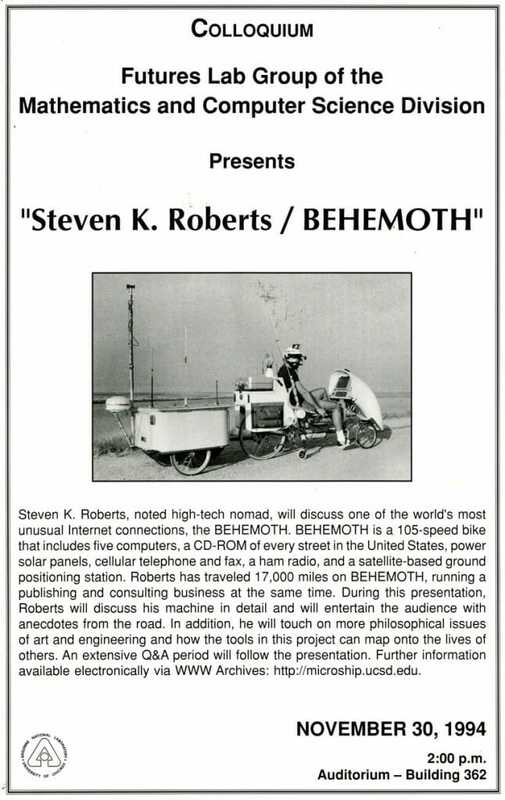 Steven K. Roberts, noted high-tech nomad, will discuss one of the world’s most unusual Internet connections, the BEHEMOTH. BEHEMOTH is a 105-speed bike that includes five computers, a CD-ROM of every street in the United States, power solar panels, cellular telephone and fax, a ham radio, and a satellite-based ground positioning station. Roberts has traveled 17,000 miles on BEHEMOTH, running a publishing and consulting business at the same time. During this presentation, Roberts will discuss his machine in detail and will entertain the audience with anecdotes from the road. In addition, he will touch on more philosophical issues of art and engineering, and how the tools in this project can map onto the lives of others. An extensive Q&A will follow the presentation. Further information available electronically via WWW Archives. [URL updated].